Chef Ken Goff will be cooking at Le Cordon Bleu Culinary School’s restaurant, Technique, for the next five weeks. Do not miss the chance to try his food. In 2005, Goff left his position at the Dakota Jazz Club after 20 years and started teaching the next generation of chefs as a culinary instructor at Le Cordon Bleu–coincidentally, just a few months before I started teaching there myself. Since that time, he has taught just about every class the school has to offer. Now, he’s teaching and cooking in the school’s student-staffed restaurant until May 16. Chef Goff has an illustrious past. In 1995, I was a line cook at D’Amico Cucina, the flagship restaurant for the growing D’Amico restaurant group in Minneapolis. I worked on the garde manger station (that’s a fancy way of saying I made salads), which was one step above prep cook and a mere two steps above plongeur (that’s a fancy way of saying dishwasher). Meanwhile, Ken Goff was already one of our region’s most influential chefs. In 1985, he opened the Dakota, as its executive chef, and by ’95 had long since been highlighted in the New York Times, Los Angeles Times, Gourmet, and numerous other national publications, as a leader of the Midwest dining scene. He built a restaurant with ideas and rules in mind at the Dakota. As the club showcased a Minnesota jazz scene, he showcased Minnesota ingredients and was quoted in the Great Chef series saying, “I want the restaurant to reflect what the people in this region like to eat. That is what regional means to me.” He established relationships with farmers and was one the first chefs here to see the benefit of our local bounty. Thanks to people like Ken Goff, who celebrated Midwestern cuisine for its own sake, we enjoy a dining scene now recognized on a national level, garnering our state 16 James Beard cooking award nominations this year. Technique gives students real world experience with paying customers. Students work in all aspects of the restaurant’s operations. They cook, wait tables, answer phones, and help develop daily menu specials. They serve a three-course meal focused on seasonal ingredients and highlight cooking technique as a way to showcase the students’ education and learned skills. 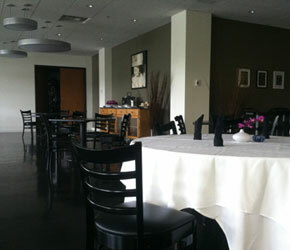 The restaurant sits at the far corner of the school’s Mendota Heights campus.